Animatsu are releasing the vintage Gainax adventure series Nadia: The Secret of the Blue Water on DVD and Blu-ray in the UK, working with their pals at Sentai for the Blu-ray masters. You can expect this 39 episode series on June 1st in complete series collections. Animatsu also launched their new website this week, and an eagle-eyed anime forumite quickly spotted that Animatsu have RWBY and Red vs. Blue lined up for release in the UK. While technically not anime, these shows certainly have captured the imagination of fans, and will be well worth a watch. All the Anime Launch Disc Replacement Scheme For Durarara!! You can’t fault All the Anime for looking after their customers. They’ve recently concluded their Cowboy Bebop and Gurren Lagann replacement schemes and now they turn their attention to Durarara!! This was a particularly thorny and disappointing issue, made all the more complicated as they’d relied on an Australian partner for the Blu-ray masters. Alas when the Collector’s Edition was released, those discs revealed subtitling problems so deep that the viewing experience was impacted both in English and in Japanese. All the Anime are putting in the expense to remaster the show from scratch, getting the subtitling right, and for the Standard Edition Blu-ray and the long delayed DVD release, it should all be hunky dory. Fans who bought the Collector’s Edition can now put their names down for replacement discs. Read more on how to apply for replacements on the Anime Limited Website. I went full on anime last week, getting four reviews out into the ether, although two of them were ‘cheating’ so to speak. I began with my first cheat, as I took a second look at Shiki: Complete Series this time on Blu-ray. It’s a show that definitely deserves the HD presentation, and with Funimation re-releasing it on the S.A.V.E. budget label, you now have no excuse to take in this rather unconventional vampire anime, which once you get past the flamboyant bloodsuckers and fearful villagers, has a lot to say about mob mentality and human nature, and it does it in a way that makes you question your own choices and attitudes, which is never a bad thing. Then it was the turn of Ben-to Complete Series (insert rant about Blu-ray absence and Manga’s UK authoring at your discretion). All that aside, this turned out to be a wacky and unexpected comedy that crossed Fight Club with packed lunches. Students are poor, students get hungry, students like half price pack lunches, a.k.a. Bento, only a handful of Bento get cut to half price at the end of the day, students and other hungry (like the) wolves have to do battle to claim their prize... You can read more about this hilarious show by clicking on the review. Next up was the further adventures of Koyomi Araragi as another instalment of Monogatari arrived for review. This time it’s Onimonogatari, placed annoyingly right in the middle of a really interesting story arc, breaking it up and delaying that inevitable emotional release at the end of the series. 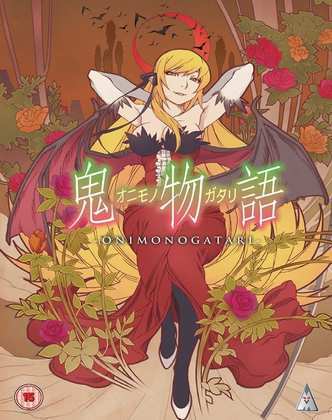 But Onimonogatari might just be a good enough story in its own right, and it certainly has its emotional climax. Read more by clicking you know what. Funimation’s S.A.V.E. re-release of Shiki came out last year as a Blu-ray DVD combo collection. 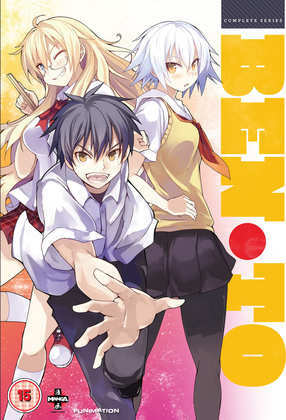 Manga Entertainment release Ben-to Complete Series on DVD on the 16th of March, the same day that MVM release Onimonogatari on DVD and Blu-ray. 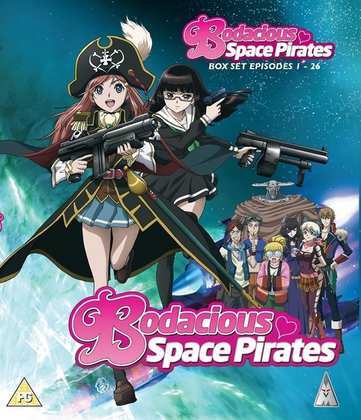 MVM’s Bodacious Space Pirates Complete Blu-ray Collection came out in 2014 (The DVDs have been out for ages).